This brand new set photo comes to us courtesy of the folks at Coming Soon, which has a full gallery of images that were sent to them by one of their readers. The expanded set is being built in the Gold Coast Hinterland in Queensland, Australia where most of the production will be held. 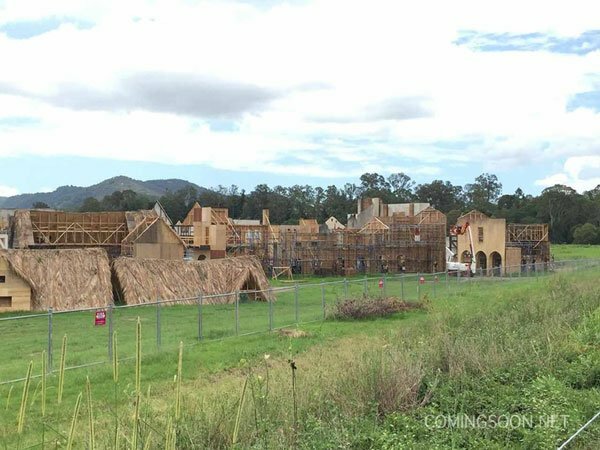 It's hard to say exactly what is being built here, outside of the fact that it looks like a full town from the 18th century, but it definitely is an encouraging sign for a movie that has had its fair share of delays. After all, it was all the way back in May of 2013 that Kon Tiki directors Joachim Rønning and Espen Sandberg first signed on for the project, and there were intentions to start filming not too long after that. Then, in September of that same year, Disney announced that they were pushing the project from its 2015 release date to an unknown weekend in 2016. In March of last year it was reported by the studio that they still didn't have a script that they were happy with, and it looked like the future of the franchise was in jeopardy. It seems that after all of that turmoil, the ship has been righted and Pirates of the Caribbean 5 is ready to set sail for a 2017 release date. While not too much is known at this point about the plot of Pirates of the Caribbean: Dead Men Tell No Tales, there have been some rumors, and a few details have come out of casting reports. Naturally, Johnny Depp is coming back to once again reprise his role as Captain Jack Sparrow, and he will be joined by Geoffrey Rush's Captain Barbossa. Javier Bardem will be playing the main villain this time around, and in the spirit of Orlando Bloom and Kiera Knightley's roles in the first three movies, there will be another pair of lovers at the center of the latest sequel. Brenton Thwaites has been cast to play a British soldier Henry, and Disney is currently looking at Lucy Boynton, Alexandra Dowling, Kaya Scodelario, Jenna Thiam and Gabriella Wilde as potential love interests for him. There have also been reports saying that Orlando Bloom could possibly return to the series as well, but that has not yet been confirmed. Pirates of the Caribbean: Dead Men Tell No Tales will be starting filming very soon, and will be coming to theaters on July 7, 2017.